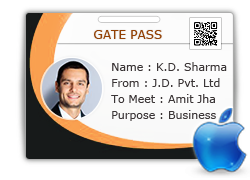 DRPU Mac Gate Pass ID Cards Maker & Visitors Management Software facilitates to generate visitor ID cards with photo and Gate Pass for visitors using Mac machine. Software facilitates mac users to manage all incoming and outgoing planned or unplanned visitor’s from your office or company. Mac Visitor ID card designer tool provides option to save all visitor details to database for future reference and facilitates to search particular visitor information according to Name, Company Name, Phone Number, Address, Email, Visitor Number, Date Range etc. 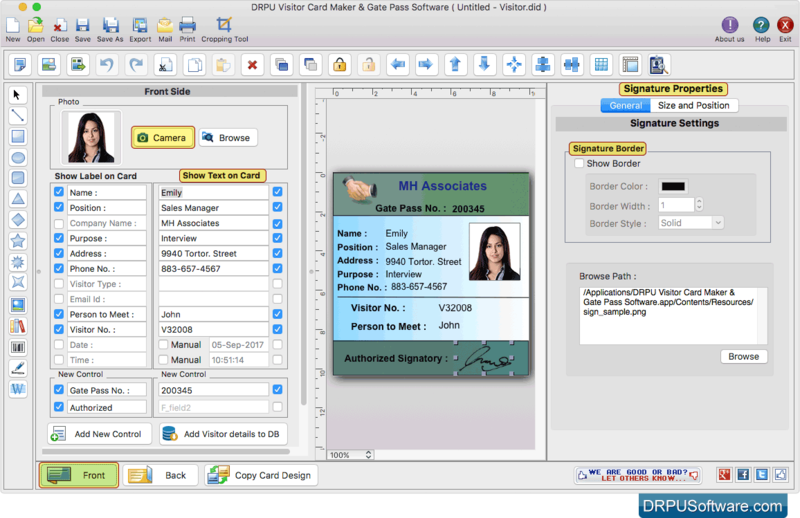 Software quickly design visitor ID Card or Gate Pass for visitors by choosing id card design from pre-defined templates. You can add photo on visitor ID card by capturing visitor's image using camera settings or by browsing path of visitor image. Software helps mac users to add all-relevant information about the visitor to the database. You can print designed visitor ID cards using flexible print setting option. Software provides camera to capture photo of your visitor for designing ID card or Gate Pass. Provides Image Cropping Tool to crop a single image or to crop multiple images for visitor ID card. Export designed visitor ID card as Image (JPEG, PNG etc. ), as PDF and as Template. Software is having inbuilt E-mail setting feature to send designed visitor ID cards to the specified email address. Design visitor ID Cards using various designing tools including Rectangle, Ellipse, Triangle, Symbols, Signature, Barcode, Watermark etc.